Writing a novel is a FANTASTIC idea. It’s one of the most satisfying experiences in the world. The THRILL of putting your words onto paper. The EXCITEMENT of receiving your first copy. The KICK at seeing your book featured at a local store. The BUZZ of signing your first copy. But you know what would make you feel EVEN BETTER? Knowing that you wrote your novel in just ONE SHORT MONTH – working only 40 minutes a day! It’s entirely possible to write YOUR novel in 28 short days, working less than the time it takes you to watch the evening news. Stephen King does it. So did Mark Twain, Jack London, Ray Bradbury, Diane Booher, Agatha Christie, Nick Daws, Isaac Asimov, Samuel Johnson and Charles Dickens. All of these individuals wrote their books in under a month. Barbara Cartland wrote 623 best-sellers in her life, and sold over a billion books. Dr Richard Carlson wrote “Don’t Sweat the Small Stuff” during a 12-hour transatlantic flight – and went on to sell 25 million copies. Even Mark Victor Hansen, co-author of Chicken Soup for the Soul, says he’s now churning out a book every single month. How do these individuals manage to write SO QUICKLY? Well, on this page – I’m going to tell you. "Novel In a Month is ESSENTIAL READING for all budding novelists. This step-by-step comprehensive course provides the expertise and motivation that will unlock your creativity and help you write your novel in record time! This course is your own personal mentor to success. HIGHLY RECOMMENDED!" Let Me Show YOU the SECRETS of Speed Writing! Your Finished Novel - Ready for the Publishers! I’m Dan Strauss – and I’d like to welcome you to this site! I’m the senior editor behind the Global Writing Network, and have previously worked with major publishing houses - including Springer, Apress and Inspire3 Publishing. I’ve personally written and had published over 30 fiction and non-fiction works. I’m the author of a bundle of screenplays, and I’ve helped write over 100 winning book proposals. YES – I know the industry. And I’ve spent the past five years working with and advising some of the BEST “speed writers” in the industry. I’m talking about prolific authors that are churning out book after book after book. Take Nick Daws for example. Nick is an inexhaustible British author of over 50 best-selling books. Some years ago, I consulted with Nick to help him launch his best-selling course at Write Quickly.com. James is a master Hollywood screenwriter. And after studying with me, James began producing new screenplays at a rate of one per month. I later helped him to launch his own guide to speed screenwriting, Movie in a Month. YES – There are SECRETS to writing this quickly. I’m talking about a handful of little-known tricks that will enable you to write your manuscript faster than ANYONE ELSE. Secret little methods for speeding up your writing, crushing creativity blocks, and boosting your editing time. Techniques that will get your novel OUT of your mind and down on to PAPER. A pristine and polished novel. In just 28 days. I’ve helped train many gurus in the world of speed writing. But most have focused on how to write non-fiction books. They’ve never applied their secret techniques to writing a NOVEL in just 28 days. "Dan has done it again! In his trademark easy-reading style, he reveals how anyone can complete a novel in four weeks or less." Discover SECRETS of the World's SPEED WRITERS! Write YOUR Novel, Working JUST 40 Minutes a Day! You’ve got a novel burning inside. I know that. It’s powerful. And you’d like nothing more than to take the time out to actually get that story down on paper. Then, some months later, to walk in Barnes & Noble or Waterstones, and to see it there – sitting proudly on the best-sellers shelf. Can you even IMAGINE how thrilling that could be? If ONLY you could find the time. Right? You don’t NEED the time. One of the busiest guys that I know is the former head honcho of the Self Development Network, a guy called Karl Moore. In his previous role as CEO, he employed dozens of individuals, ran a network of around 200 websites, and helped to handle an affiliate program of ~20,000 individuals. He also maintained a daily blog, ran a handful of radio stations, and was constantly buying out new businesses. Yet when he followed my techniques, Karl managed to write three best-selling books in just one month - including The Secret Art of Self-Development. In May 2009, they hit the Amazon best-sellers list. And Karl did it ALL in his spare time! Karl found the time. Surely YOU can too? Writing your novel can be EASY. You don’t need TIME. You don’t need CREATIVITY. You don’t need LUCK. You don’t need TALENT. You don’t even need to be an impressive WRITER. Writing a novel is SIMPLE and EASY. But ONLY when you discover the secrets of speed writing! "If you want to write YOUR novel in just a month, and sell it to a fantastic publisher, this book is a MUST. I've done it myself. I know it works. And I owe my success to the techniques you'll find inside this course." From Outlining to Plotting to Character Development! Discover the SECRET SHORTCUTS No-one Has Told You! Are you open to the idea that maybe – just maybe – you can write, edit and polish your entire novel in JUST 28 days, working ONLY 40 minutes a day? 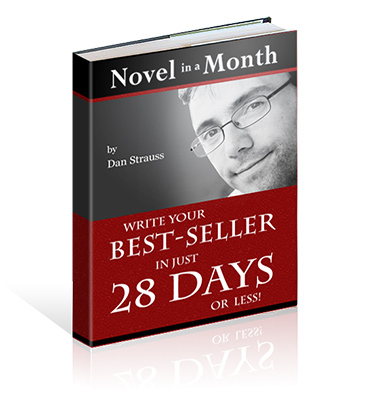 My brand new course, “Novel in a Month,” is the ULTIMATE guide to writing your best-selling fiction book in just 28 days. It shows you how to develop your characters. Create a best-selling plot. Move the story forward. Keep the tension building. Write an explosive ending. And all of this combined with uber-powerful, lightening-fast speed writing techniques. The speed writing is critical. Any book can tell you how to write plain old fiction. But NO book shows you how to write your own novel – in JUST 28 DAYS. So, are you ready to write your book – in absolute RECORD time? "I've written dozens of books for the self-help world. If I spent months on each project, I'd never finish. With Dan's techniques, I'm able to write my books in just a matter of days. Brilliant!" Want to Write YOUR Novel in Under FOUR WEEKS? & Uncover the TRUE SECRETS of the Speed Writers! Would YOU like to learn more about my new course, “Novel in a Month”? Just read on to discover a FEW of the many writing secrets you'll discover inside my 140+ page course - from the P.L.O.T. system to "Mega-Quick Character Creation." It contains EVERYTHING you need to know to write YOUR own novel in just 28 days, working as little as 40 minutes per day. Exactly how to EFFORTLESSLY write your best-selling novel in 28 days, or less, working just 40 minutes a day! An ENTIRE week-by-week plan for writing your novel – including PRECISELY what to do at every step, and how much to write each day! The P.L.O.T. system for quickly creating a killer story-line that will keep readers turning page after page – DESPERATE to reach the end of your story! How to write the MOST GENUINE character dialogue possible, QUICKLY – all thanks to a piece of advice from Ford Madox Ford! SEVEN BRILLIANT TECHNIQUES for keeping your reader interested – stolen straight from the big name authors! Why SCENES and PLOTTING can RUIN your efforts to write a great novel –and EXACTLY what you can do about it! The “POPULATION INDEX” of your novel – and how this can help build a fantastic fast-paced, character-driven, page-turning story! The SIX THINGS you MUST do to build ANY character in just minutes. Get these wrong and your story will seem EMPTY! The FIVE-STEP FORMULA for writing a KILLER opening, QUICKLY - this is CRITICAL to selling your book to a publisher, and can treble your bookstore sales! The SECRET SOURCE of UNLIMITED PLOTS! Simply use our little-known trick and you’ll have a ready-made, best-selling plot – right off the shelf! The SEVENTEEN QUESTIONS you can ask to kick-start your imagination – and give yourself a plot, even if you’ve no idea what you want to write about! The SIX universal plot archetypes – and how you can use them to build your story FASTER than ever before! Precisely how to duplicate Jack London’s secret method of writing it RIGHT first time, EVERY TIME! Why TRANSITIONS are vital to the flow of your book – and our TOP FIVE “Swipe File” of hot techniques, including advice from Raymond Chandler! The SECRET WRITING MYTHS that have been holding you back from success as an author. Blast these and you’re ready for action! The SPECIFIC STEPS you need to take to QUICKLY fine-tune your writing, NO analysis, editing or effort required! The SMART way to rewrite and edit your novel – in just ONE DAY! Our TOP FIVE TIPS for quick and easy editing! How to write in FIFTEEN MINUTE BLOCKS, to help you write quicker – and ensure you NEVER get bored and NEVER experience writer’s block! SEVEN WAYS to refine your writing style – and swiftly turn your novel into a work of art! How to give your novel a BOOST – by attracting celebrating endorsements, in JUST TWO WEEKS! The mysterious world of the COVER LETTER – and the six steps that will virtually GUARANTEE you a publishing contract! The EXACT seven-step system you need to know for finding the best agent or publisher in town – and how to get YOUR novel onto the shelves! Would YOU like to discover these secrets – and be holding your own novel in just ONE MONTH from now? Imagine that. This time in May, you could have finished your novel. "As a published fiction author, I used to spend hours slaving over a tricky manuscript. But with Dan's course, writing is suddenly a breeze. It's easy to come up with plots, to write dialogue, to complete my next book. In fact, my writing has already improved so much - I've just been commissioned for a new series of children books, by a popular Canadian publisher!" - Mel McIntyre, aka "Top Copy Guy"
Here's How to GUARANTEE the Success of Your Novel! Including My Secret Black Book of INSIDER Contacts! When I wrote this course (in much less than a month, incidentally) – I wanted it to be the VERY BEST. I crystallized over five years of knowledge to help turn YOU into a publisher novelist. There's no question about it. I want to see you PUBLISHED. You’ve read a million novels. But do you REALLY know how to format your dialogue? This guide unveils EVERYTHING you need to know. From commas to paragraphs, from speechmarks to quotations, from interrupted speech to my own four-step punctuation trick. Learn EXACTLY what you need for perfect dialogue – and precisely how to get it down on paper. So, you’ve written your first draft – but want to really fine-tune your work? This guide shows the EXACT steps you need to polish your manuscript. From injecting a little mischief to ending with a BANG, from tightening up your dialogue to tying all of the loose-ends together. All great novels need fine tuning – and yours will truly be a GREAT NOVEL after reading through this bonus guide. What good is a fantastic novel, if nobody knows about it? This 15-page bonus guide shows you exactly how to get your book promoted – on a shoe-string budget! From radio interviews to book signing, from blogging to online forums. This guide shows you how to promote your novel like mad – and how to capitalize on your expertise with the media. Just imagine if your book had a celebrity endorsement from Stephen King, Jackie Collins, or J.K.Rowling. How would THAT impact your sales? How quickly would you be able to sell the book to a publisher then? In this fantastic bonus guide, I unveil the EXACT STEPS you need to grab yourself brilliant celebrity endorsements – in just a couple of weeks! You have yourself a great fine-tuned novel, and a list of celebrity endorsements. But where do you go next? Easy! Just take my little black book of personal fiction contacts – and contact them all! This bonus guide contains over 40 jam-packed pages full of individual contacts, e-mail address, websites, guidelines, requirements, and more. Make it big – just get in touch! Each of these bonus guides were hand-written by myself – and they’re all YOURS, absolutely FREE of charge – when you decide to own the “Novel in a Month” course. Read on to grab your copy TODAY! "I've always wanted to write my own fiction book. With this course, I managed to complete my first draft in just two weeks - and expect to complete everything by the end of the month. I'm completely impressed. I never realized writing could be this fun - or this easy. Absolutely amazing!" I'll Give You Absolutely EVERYTHING - At This LOW Price! So, are you ready to WRITE YOUR NOVEL – in just 28 DAYS, or LESS? And I’ll show you how to bring all of this together to help create a BRILLIANT, full, edited and polished novel – in just 28 days, working just 40 minutes a day. All inside my 140+ page course, "Novel in a Month." I’d also like to give you my FIVE BONUS GUIDES too, to help GUARANTEE your success! There’s literally NEVER been a better time to order this course, and write your best-selling novel. In fact, this site has NEVER offered the course at such a low price before. Then CLICK on the button below – and get ready to have YOUR novel finished in just 28 days from now! Here's My 100% NO-RISK Money-Back GUARANTEE! Try the Course for 1 ENTIRE MONTH - If Your Novel Isn't Finished & PUBLISHED By Then, I'll Refund Every Cent! Buy the full course TODAY – Absolutely RISK-FREE! I want you to feel comfortable buying your copy of this course. Which is why I’d like to offer you a NO-RISK, 100% “I’m Thrilled” refund guarantee! Try out the entire course for a whole three months. If you HAVEN’T managed to write your first novel AND get it accepted by a publisher, then just return it, and we’ll refund every penny you paid (minus original S&H costs). There are NO questions asked – and NO difficult return procedures. All that we ask is that you try out the system for at least one month, and return it within six months. This guarantee is also FULLY BACKED by my publishers, the Global Writing Network, so you can be sure your money is in safe hands. "EVERYTHING is covered, from preliminary outlining through to marketing your finished book. If you've always wanted to write a novel but didn't know where to start, 'Novel in a Month' will give you the framework you need to SUCCEED." Every day, thousands of individuals dream of writing the Great American Novel. But in reality, very few people do. Because they still believe that it takes arduous amounts of time. Not to mention creativity. Luck. Talent. Industry contacts. There are secrets you haven’t been told yet. - And find out for YOURSELF how easy it is to write your novel, in just 28 days or less! Make the decision. And get ready to enjoy life as a published novelist! Author, "Novel in a Month," "Book Proposal Secrets"
PS. The Novel in a Month course is ONLY available from this website! You can’t buy this course in stores, at eBay, or elsewhere online. It’s EXCLUSIVE to this website. So if you want to write a novel in 28 days, or less – you’re at the THE PLACE to find out how. Click here to purchase! PPS. Can you IMAGINE the feeling... of walking into your local bookstore, and seeing your novel on the shelves? People are reading it. Chatting about it. Smelling the fresh bind. They recognize you as the author. You kindly offer to sign a few copies for the store. You’re a local celebrity. You’re a published novelist. And it can all happen for YOU – in under a month. Click HERE! PPPS. Remember, you are NOT alone in using these techniques. ALL of the best authors write fast, using the secret techniques shown inside this course. From Charles Dickens to Marc Victor Hansen. And now YOU can learn their speed writing secrets – for the very first time. Click HERE to own the entire course!